The true crime is this movie’s shallowness. TRUE CRIME has the potential to be a powerful thought experiment, exploring the psychology behind the perception of what True Crime truly is. Aside from implicit racism, no real issues are broached in this dialog-driven Clint Eastwood actioner. From an Andrew Klaven novel, TRUE CRIME is merely the tale of a wrongly-convicted murderer on death row, Frank Beechum (played stolidly by Isaiah Washington) and curmudgeon reporter, Steve Everett’s (Eastwood) 11th-hour hunt for the truth to grant his stay of execution. The question of what criteria constitutes True Crime is never raised. The plot involves a young black man robbing a grocery store and accidentally killing the pregnant female clerk, while Beechum happens to be in the store. Beechum is convicted for the crime on the tried-and-true Whitey charge of “Being Black And Nearby.” To really bite at the meat of the movie’s title, we would be exploring who is more of a criminal: the robber-murderer, or the congressperson whose mismanagement of social policy created the necessity for the robber to turn to crime for survival in the first place. In other words, is the bottom rung of society to blame for their survival instincts, when those instincts are only brought into prominence because white-collar criminals create a disparity of wealth in society to begin with? Well, slap a little racism in there – keep the deep thinkers at bay. For a second. There are a few too-convenient plot points and pulp coincidences, and we shudder to think how a less talented director might have made a mush of them. 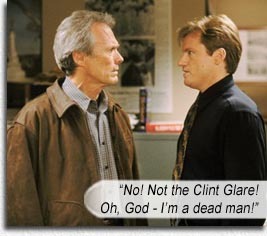 Only Eastwood directing Eastwood can get away with contrivances like Everett knowing the governor personally and later calling in a favor in the dead of night when the clock is ticking down; only Eastwood directing Eastwood can make sexagenarian Everett a convincing skirt-chaser, involved with a fellow reporter’s (Denis Leary’s) wife. Only Eastwood directing Eastwood, Etc. For the simple story it is, TRUE CRIME hits its marks and pays off: dialog is snappy, especially the uber-masculine repartee between Eastwood, James Woods (as his editor) and Denis Leary; the principals give nuanced performances – Lisa Gay Hamilton as Washington’s loyal wife, Diane Verona as Everett’s estranged wife, Michael Jeter as a slimy eyewitness; Bernard Hill as a sympathetic warden and Michael McKean as a boneheaded priest. Eastwood’s real-life daughter, Francesca Fisher-Eastwood (from ex-wife Frances Fisher), plays his cute little daughter. Writers: Andrew Klaven, Larry Gross, Paul Brickman, Stephen Schiff. Starring: Clint Eastwood, Isaiah Washington, James Woods, Denis Leary, Lisa Gay Hamilton, Bernard Hill, Diane Venora, Michael McKean, Michael Jeter, Mary McCormack.